I have tried different models from different manufacturers, but DeWalt DXAEPS2 meets my needs perfectly. 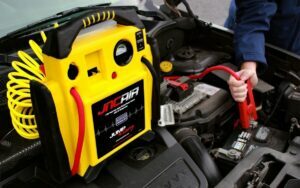 However, it is not just a simple jump starter. It is a super powerful station that is able to help you deal with a range of problems. 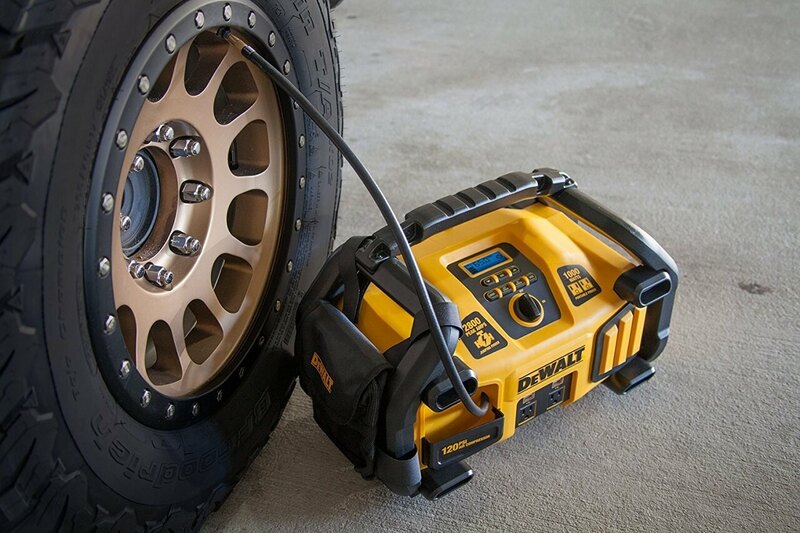 One of the great features that this device has is a super powerful air compressor. It is powerful enough to inflate a tire of a truck quite fast. The first thing that you will inevitably notice when you see this device is how massive it is. It should not scare you. Of course, it is relatively large and heavy, but it has a handle that helps moving it around. 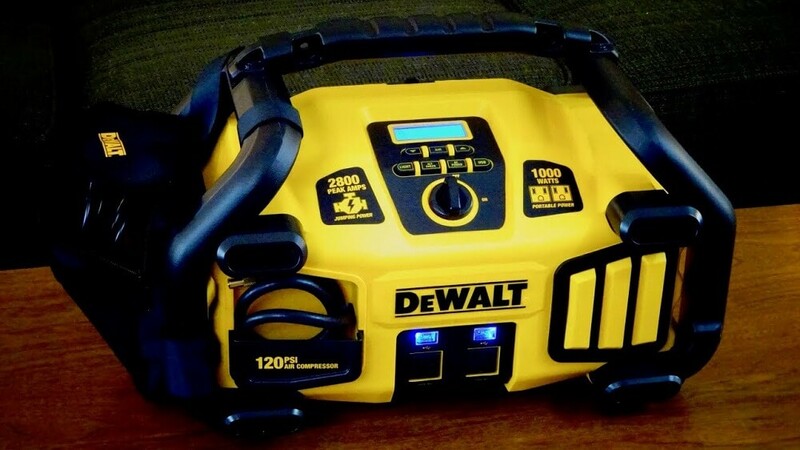 The famous black-yellow DeWalt’s design is attractive as well. It has the most important elements only. It has a small black panel with a LCD display where you can see all the important information you need. The case is quite strong and you can be sure that you will not damage it. Moreover, it has a frame may serve as an additional protection mean. The great thing about this device is that the clamps can be detached and you will not have to deal with cables. The clamps are made of very durable material and they will serve you for long. It also has a LED light. Therefore, it can be used when it is dark. Overall, it is a very good device that is powerful enough to start even a heavy-duty truck. 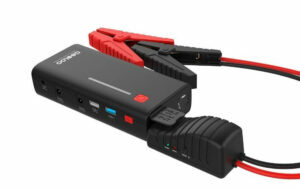 This jump starter helped me many times. 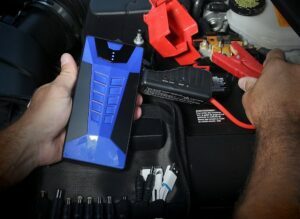 The device has a solid capacity, so you will be able to start your car a lot of times without recharging the jump starter over and over again. It means that the battery capacity is very high and you can start up an engine multiple times before recharging the device. It is important for this kind of devices, since you never know when you need to use it. 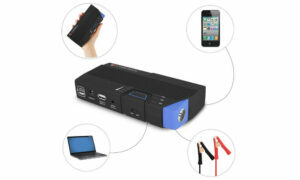 Moreover, this device can be used to charge different devices. 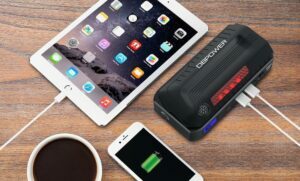 It has USB ports that let you charge tablets, smartphones, or any other devices. It is a great device and if you travel a lot or you drive through the country then you must have this device. You can be sure it will help you. 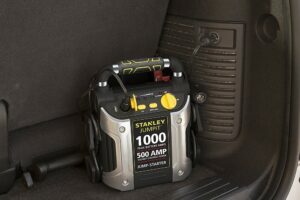 Characteristics of a jump starter are extremely important. This device has many wonderful features, but the most important one is its availability to start up an engine. 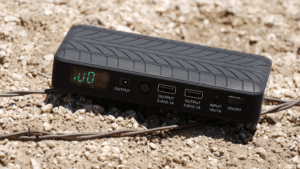 Modern jump starters have many additional functions and this device is not an exception. 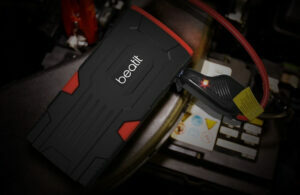 The peak power is 2800 amp. 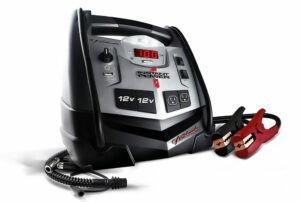 The instant power is 1400 amp. 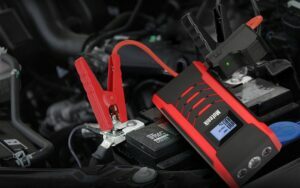 It is enough to start up cars, motorcycles, boats, light- and heavy-duty trucks without any problems. A LCD display provides you with the important information. 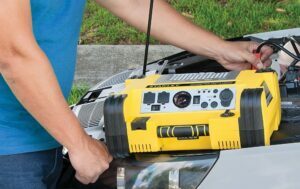 A LED work light makes it possible to use in dark areas. The clamps can be detached making the device easier to handle. Two USB ports to charge different devices. The clamps are powder coated. They will serve you for long. The device is completely safe. It has a special alarm that informs you in the case you connect clamps in a wrong way. You can check your car alternator with an alternator check. 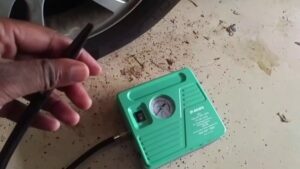 A 120 PSI air compressor. 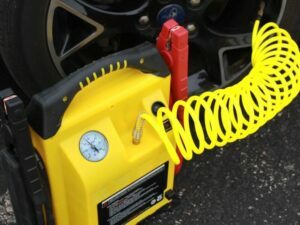 It can inflate tires or other equipment very fast. The nozzle can be connected tight enough to exclude any air leaking due to the special technology Sure Fit. A built-in charger. You do not need any special devices to charge the batteries. The device is designed in accordance with modern safety standards. The weight is 36.6 pounds. The dimensions are 19.5 x 11.5 x 12.5 in. It is quite large and heavy. The device uses non-standard batteries and it may be difficult to replace them in the case of their failure. 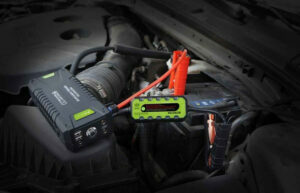 This is a perfect device for drivers, especially if you have a light- or a heavy-duty truck. It is quite large and heavy and it may be not an option if you have a small car. It has many useful features that can help you deal with a wide range of problems. The device is safe since it was designed and manufactured in accordance with modern safety standards. 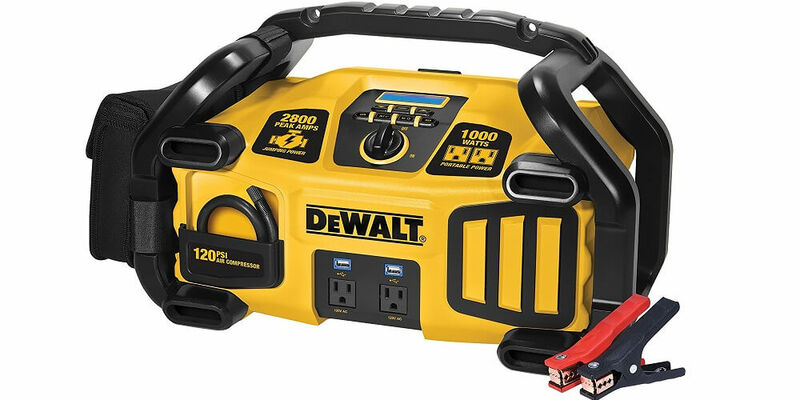 DeWalt is a well-known company that offers high-quality solutions. They have already proved how reliable their products are. 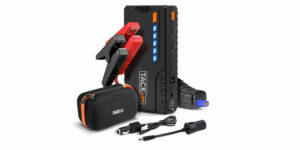 This jump starter has many wonderful features, like an air compressor, USB ports, a LCD display, a LED light, etc. 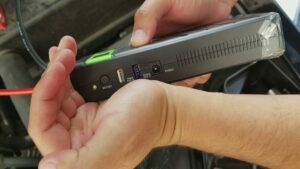 It makes the device very useful, especially if you have an old heavy-duty truck. 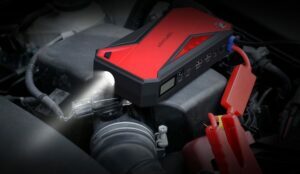 Moreover, if you do not need to jump start an engine you can detach the cables and use it as a power station and charge different devices or use it as an air compressor. The power of this device is enough to start even a heavy-duty truck without any problems. Of course, it has some disadvantages, like dimensions and weight. It takes some space and it may be not an option if you have a small car. It also uses non-standard batteries and there are may be problems with their replacement. 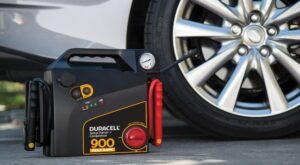 In any case, it is still a very good device that does what it should – it jump starts a vehicle. Plus, it has many other important features. I recommend this device to all drivers of light- and heavy-duty trucks. You can be sure, it will help you.